There are many options for wood to use in Indonesian made furniture. By reading this article you will better understand which wood to use for your wishes and budget. Teakwood (Tectona Grandis) is a tropical hardwood widely used for furniture, especially in Java, Indonesia. 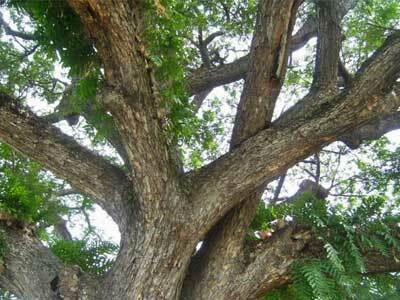 A Teak tree can grow up to 40 meters high with a diameter of up to 1,5 meter. Unfortunately these big diameters are rarely found since the trees are cut down long before that to make the furniture. The diameters used in Java are normally maximum 40cm. The leaves of a teak tree are oval with sizes of 15 to 45 centimeter. Small white flowers with a nice smell grow on the tree. The color of teak wood is somewhere between brown and gold. As the wood dries and ages the color will become more dark. Furniture that is used outdoors will turn to grey after long exposure to outdoor weather. The sapwood of teak is white-yellow. 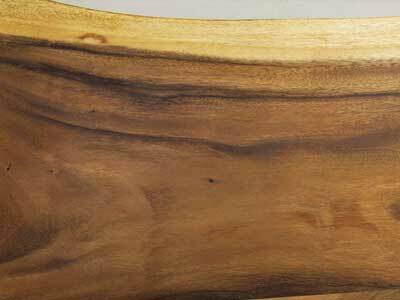 The sapwood is much softer and not suitable for outdoor use. 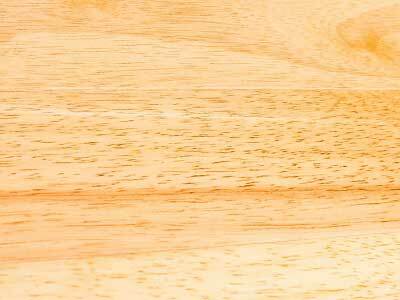 There is naturally a lot of oil in teak wood which protects it for almost any circumstance. Sometimes the wood has dark lines running through it, this is the path of the oil. All our teak comes from government controlled plantations in Java, Indonesia. The government controls the cutting of hardwood species that are cut down in Indonesia. This way the forests can be protected. Every log gets its own number which can be used to trace the log. Teak wood is mostly used for outdoor furniture, but also a lot for high-quality indoor furniture. Also for boat decks and flooring it is used a lot because of its strength. To get the looks of teak wood for a lower price many companies also use teak veneer. 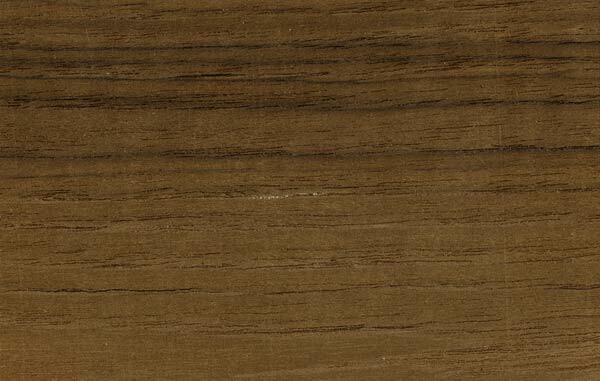 This is a thin layer of 1 millimeter teak wood, which is glues onto a cheaper species of wood, or even onto plywood. Teak is also a very popular wood species to use in doors and window frames since it you withhold any weather. Mahogany wood grows on many places in the world. 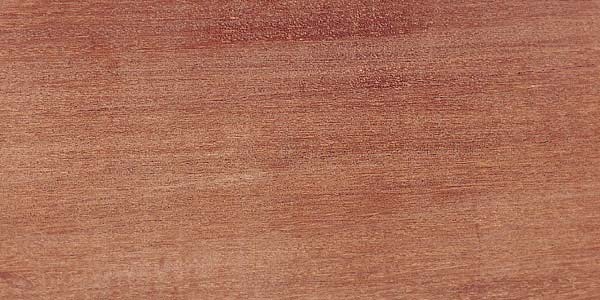 The mahogany we use is Toona Sureni, which is native to Indonesia. The mahogany tree can grow up to 50 meter tall. The stems in Indonesia usually have a diameter of max 60cm. The leaves of the mahogany tree are pinnate with a length of approximately 40cm. Mahogany trees have small fruits of about 3cm that contain seeds and can’t be eaten. Mahogany is originally colored red. Since this color is not desirable the wood is mostly finished in a darker color. There’s also the option to bleach the mahogany and then finish it in a teak-like color. The mahogany wood comes, like the teak wood, from government protected plantations. Mahogany wood can be used with clear or colored finishing. With clear finishing you will still see the red glow that mahogany still has. A solution for this is to finish it with a dark brown stain. For colored finishing mahogany is our first choice because of its strength. Mango wood comes from the tree that grows mango’s. The trees are in general planted to harvest the fruit. After several years the tree will stop product fruits, and is ready to cut down to use the wood. The trees grown until 40 meters tall, with a stem diameter of up to 1 meter. Mango wood has to be treated before it can be used in furniture. If not, it will be eaten by termites in less than a year. Mango wood comes from either mango plantations or from villages where people grow their own mango trees. It is a not protected wood species since it is mostly derived from plantations after the tree stops delivering the fruit. The wood from mango trees is widely used in cabinets. Since the cost are much lower than teak or mahogany a lot of money can be saved. For use in chairs or tables you must be careful since it’s not as strong as mahogany or teak. The grain can differ a lot per tree, so it is used a lot with solid color finishing. Sonokeling is a very beautiful wood, with a more darker color. The color varies from darkbrown until dark purple. 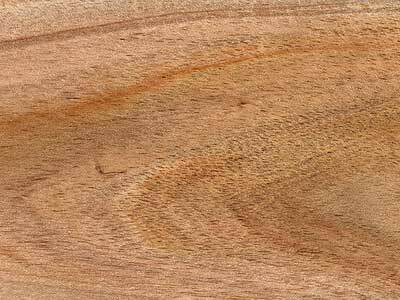 The sapwood is very white, which can be cut of, or used to make a beautiful contrast. The wood is also often used to make musical instruments. The trees grow up to 40 meters tall. Sonokeling is now listed as an endangered species, and can therefore not be exported to the USA. The Indonesian Sonokeling is not endangered, but Rosewood has been added to the list of endangered species as a whole. The trees grow on government controlled plantations. Since it is an endangered species it can not be sold as a raw material. Finished products can be exported worldwide, with an exception of USA. Rosewood has a very beautiful grain. Therefore it is not only used in furniture, but also in musical instruments. For furniture it can be used with or without the white sapwood. The finishing is mostly transparent, sometimes with a bit darker stain. Sonokeling is strong enough to use it in any kind of furniture. Suar wood, also know as monkeypod is a large tropical tree. The color is originally brown, but will change to a gray color after a while, especially if it catches any sun. Suar wood contains a lot of water, which can be damage the suar but also other goods in the container. With the right drying oven it can be dried, but will still take more time than average. The trees grow up to 25 meters tall, where the trunk reaches a diameter of up to 2 meters. The Suar tree grows all over Indonesia. An SVLK license is needed to export the wood from Indonesia. The suar tree grows on government controlled plantations. Suar wood is mostly used in big slabs for table tops. Because the diameter can reach up to 2 meters, one solid piece of wood can make a very solid looking dining table. 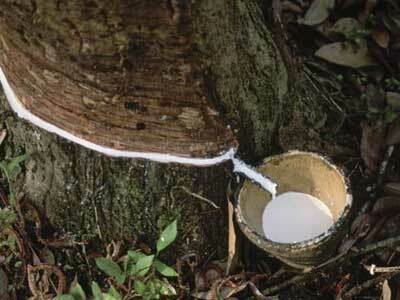 Rubber wood, also known as Hevea, is taken from rubber plantations after the trees stop producing the rubber. It is not elastic as the name might suggest. Rubber wood is often labeled as environmently-friendly because it is a waste product from rubber plantations. In the last decades the wood became more popular because there are more products available to protect it from being eaten and rotting. 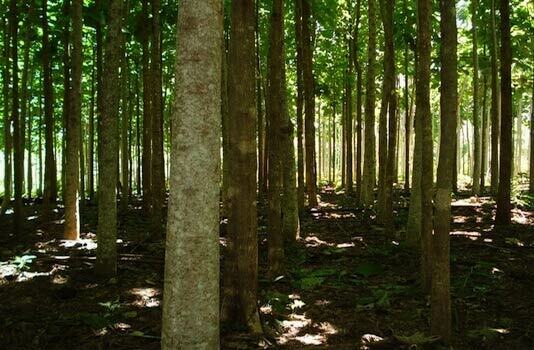 The trees grow up to 40 meters high in forests, but from plantation they are usually smaller. The diameter is around 30 centimers. 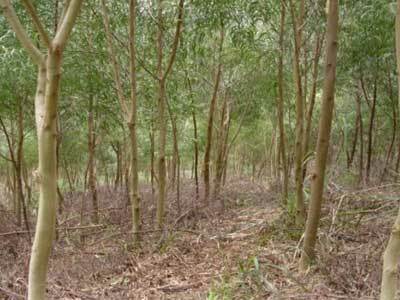 Rubber wood is collected from rubber plantations after the trees stop producing rubber. It is in fact a waste product which makes it a responsible choice for furniture. Rubber plantations are found all over Indonesia. Can be used in different kinds of furniture. But has not a very nice grain so it is often painted or covered with veneer. Has to be treated against animals and fungus before use. 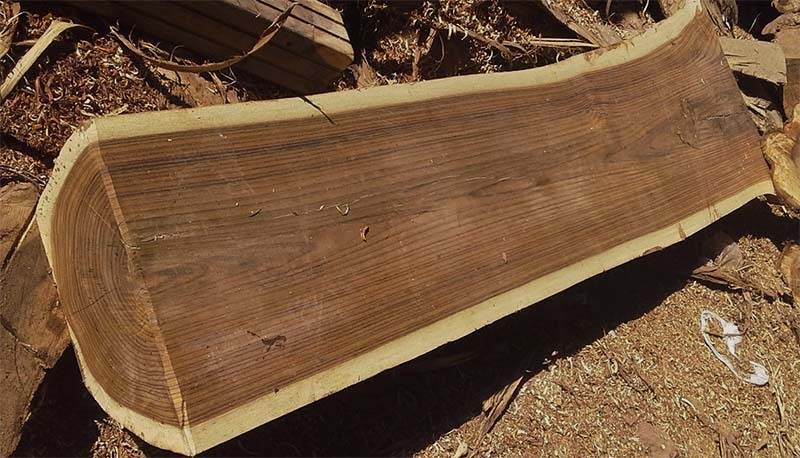 Acacia wood comes from the Acacia tree, of which there are more than a thousand worldwide. The type of Acacia used for furniture in Indonesia is Acacia Mangium. The wood is hard and strong by itself, but tends to bend a lot in the drying process. 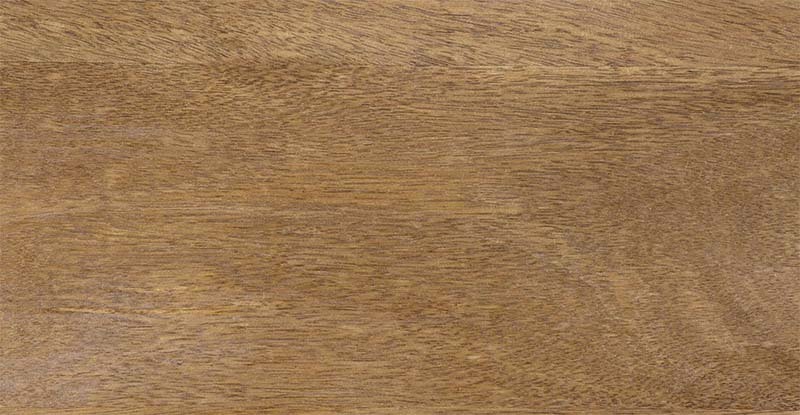 The grain is slightly similar to teak, but the color is different. Nowadays Ikea uses a lot of Acacia in their furnitures. The tree grows up to 30 meters high with a stem of up to 30 centimers. Acacia grows in government controlled plantations, and is easy to find. The plantations can be found all over Indonesia. Acacia can be used for different kind of furnitures. It has to be dried very well in order to prevent the bending in finished furniture products. Hi, just wondering if you could help me. I purchased a piece of ‘weathered look” furniture that was made in Indonesia online. (From an Australian company) It is emitting a very strong smell like a cross between chemicals and hickory/bbq. The smell will not dissipate. It leaches into anything put into the drawers. The company say it is not harmful just the natural wood smell. Is there a type of wood that smells that bad? Or do you think they are palming me off? It sounds like this smell comes from the finishing. The commonly used woods in Indonesia do not have a strong smell. Might be some chemical in the finishing, or sometimes they use vinegar for a weathered look. we are looking for supplier for wood log table in Indonesia. we are looking for a supplier of Hardwood Deckchairs made from Merpauh or similiar, is this something you can help us with? hello, om looking for hard wood floors & laminate flooring, can you advise some good company?!! I’ve sent you an email, thank you. Hi, is there a different demand for different tropical wood species in Indonesia? Is there a much greater demand for Teak and Mahogany compared to the others? Teak has the greatest demand in Indonesia. Mahogany and Suar also have a pretty big demand, other mentioned wood have less demand. can Merbau used for indoor purposes like main doors and bedroom doors ? Will it be advisable to use Merbau than teak ? Yes, Merbau can be used for doors, indoor and outdoor. Merbau is stronger and harder. Beside that, it’s also more heavy, so make sure to use the right hinges.